Just how clean is natural gas, really? Natural gas is the bridge fuel of the future that will carry the world until renewables take over. It is much cleaner than coal and oil, and it’s cheap. Natural gas is the best of the fossil fuels. Amid all this praise, it’s no wonder that the gas industry was surprised this week when the Energy Institute reminded us that while natural gas is cleaner than coal and oil, it is not a clean fuel per se. But, the EI said, a lot can be done cost-efficiently to make it cleaner than it currently is. A survey by the EI found that the great majority of the gas industry underestimates the harmful effects of methane leakages along the gas production supply chain. Methane is a much more potent greenhouse gas than carbon dioxide (28-36 times more potent over 100 years) so methane leaks are a serious challenge on the road to achieving the Paris Agreement emissions target, the EI noted. It’s easy to understand the surprise. When you’ve been praised for supplying the world with a cleaner, cheaper fuel than oil and coal, it’s easy to push the issue of methane leaks to the back of your mind. Now the EI is bringing it to the fore — but it has good news for the industry as well. 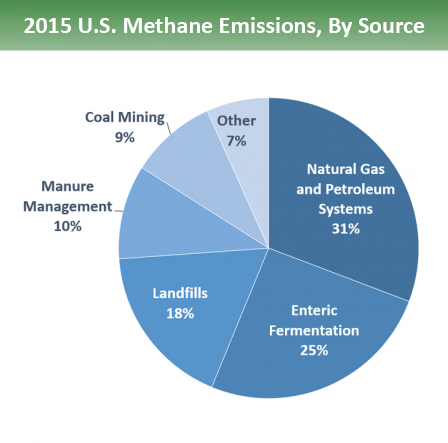 The oil and gas industry accounted for the largest portion of methane emissions in the U.S. in 2015, figures from the Environmental Protection Agency show. At 31 percent of the total — which itself represented a tenth of total U.S. greenhouse emissions — gas production was firmly in the lead. Related: Has OPEC Been Too Successful? Motivating consistent efforts to reduce methane leaks in gas production and distribution, however, would be hard. The current administration, as part of its energy dominance agenda, is already trying to remove Obama-era regulations regarding the monitoring, reporting, and reduction of methane leaks. Turning these leaks into money could do the trick, though. In December, the American Petroleum Institute announced a voluntary methane emission reduction program called The Environmental Partnership, which involves 26 companies to date. These have pledged to deploy the latest technology to monitor methane leaks, replace or upgrade old equipment responsible for the leaks, and seek other ways to reduce emissions of the greenhouse gas. Good to hear that the API is finally saying that methane leaks matter. It took awhile. They had to wrestle with the aspect that profits may suffer if we spend money reducing leaks that are relatively minor but large in number, and spread out all over the place. Basically, even considering the bias if our current federal administration, American business and industry has decided that cooperation on cleaning up air, water and atmosphere is now something that they need to do. Heck, the way it's going, the EPA is fast becoming N/A. American corporations are taking the lead in renewable energy and in cleaning things up. Thank you advocate NGOs.